– A new ambassador, Liu Hongcai (刘洪才), arrives in Pyongyang, and is greeted by about twenty overseas Chinese students, as well as ambassadors from Germany, Russia, and Vietnam at the airport. 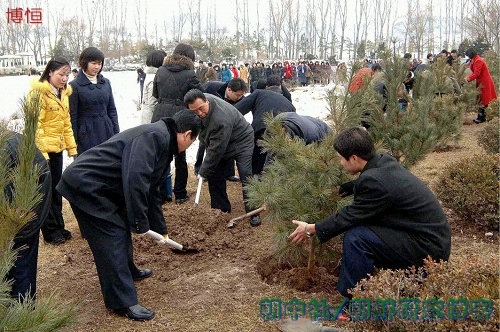 – Photo gallery of North Korean cadre planting trees. As usual, the more privileged women (attached to delegates to the People’s Congress) are wearing coats almost certainly made in China. 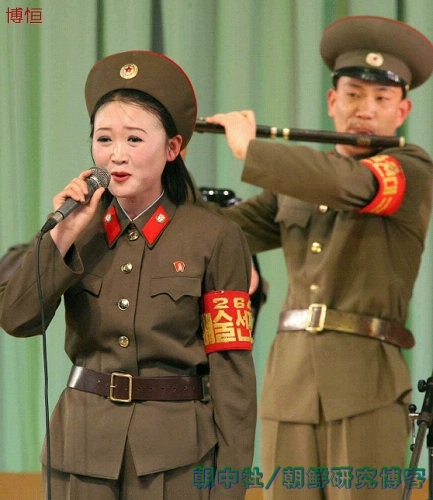 – The latest feel-good dispatch from Xinhua reporter 高浩荣 in North Korea about women employed in the restaurant and traffic-cop sectors. – Another gorgeous photo gallery from Chaoxian.com.cn featuring shots of the North Korean countryside taken by Chinese tourists with an eye for Dongbei-style tableau. It almost makes you homesick. – Some vigorous BBS discussion over a February 2010 lecture by a Yanbian University professor considering if ethnic Koreans in China should really be South Koreans. – According to the Chinese embassy in Pyongyang, the North Koreans did sign that agreement to have a new bridge built across the Yalu. – NK Leadership Watch has had several postings of late on China-NK relations, all of which are worth reading. – Yanbian police are cracking down on “illegal” Internet bars, along with illegal everything else. You’re right about the Chinese tourists’ photos. And they capture that sense of emptiness that North Korea seems to have even in major cities (never been there; this is just the feeling I get from photos and videos). If you haven’t seen them before, I can recommend Kernbeisser‘s photos of North Korea on Flickr and Artemy Lebdev’s photo series from 2006. By the way, which segment of the documentary is the one with the bunker? I don’t speak Chinese, so the rest would be lost on me. Wonderful! Thanks for the comments and the link. The bunker documentary is about 12 minutes in; I’ll see if I can get a direct URL and post it up as it’s really quite good. There are a few sentences of Korean than sneak through in the film, also.